Taylor Hughes Smith. 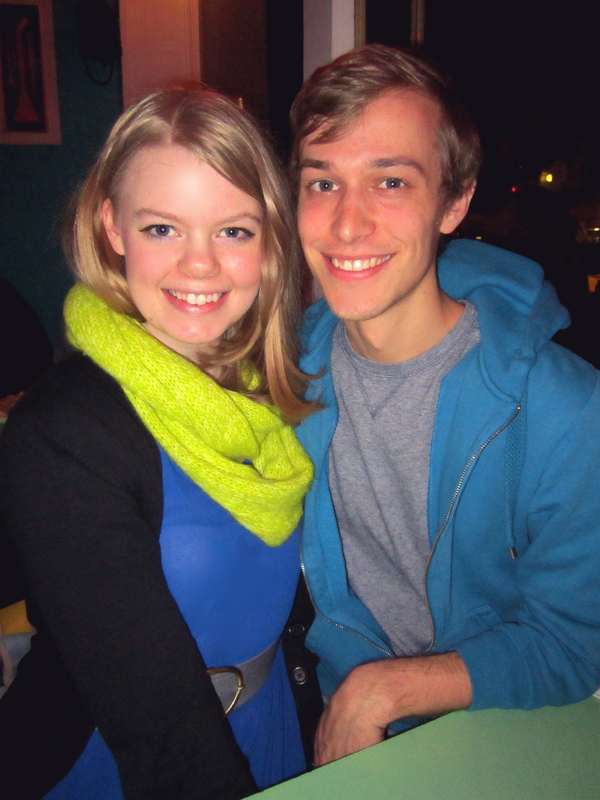 I’m thankful for him, our friendship, and the fact he lives here in this crazy, huge, weird, yet wonderful city with me. We’ve been friends since we were five, but really became closer than close in middle and high school. He is one of my oldest, dearest, best friends, and I just can’t believe we wound up here together like we always said we would back in high school when real life seemed so far away. Taylor and I always knew we were two-of-a-kind; artsy yet focused free spirits in a conservative, small town. When classmates around us talked about wanting to stay in Missouri for college, becoming a teacher or something “practical,” the two of us would just smile and nod, because we both had bigger plans. I should note there’s nothing wrong with our classmates’ plans; plenty of people do exactly that and are very happy, and I wouldn’t deign to belittle their dreams simply because they are different from mine. Teaching, banking, owning a business, being a doctor or lawyer are all noble professions, it’s just not what I ever wanted for myself. I can remember so many times we’d sit together on the way to a band competition or in the choir room, making plans and dreaming about what we’d do when we graduated and left our hometown. I’ve wanted to live in New York practically my whole life; I had this romantic vision of taxis and Broadway shows and grand apartments and picnics in Central Park. After growing up in a town where I could go to Wal-Mart and see practically everyone I knew (especially when I was buying something embarrassing like lady-parts hygienic supplies), the idea of living in a city where nobody knew my name or reputation or what brand of lady-parts hygienic supplies I bought was completely welcomed and wholly appealing. Not to mention the fact I needed to be in a place where I could embrace my art and more importantly, that place would embrace it. Taylor felt the same way. He was desperate to play in a symphony orchestra where all his hours of practicing the bassoon were not thought odd (his dream job is the NY Philharmonic). Being one of the first and few openly gay students in my high school often put Taylor at odds with other students and teachers who couldn’t and wouldn’t understand why he was the way he was (well, is). He faced a lot of bullying, hurtful comments, and downright discrimination on several occasions simply because he refused to hide who he was or change it to make himself less “controversial.” Music was his escape. And he was/is damn good at it. New York, for both of us, meant escape. Freedom. Art. Love. It became a beacon of hope in a town occasionally stuck in the dark ages. He went to school in Kansas, and I went to school in Oklahoma. We often had phone dates to catch up on each other’s lives. We were both happier being at schools where we could be free to be ourselves and pursue our passions. Several spring breaks, we both wound up being in New York together at the same time, so it became like a preview of what life could be like: our dreams inching closer to reality. When I finally moved here last year, it was without Taylor. He still had a semester to finish his second degree at KU. True, I had my other dear friends, and things were good, but it didn’t feel quite right being here without him too. He would occasionally come to visit, auditioning for grad schools and catching up with friends like me who already had lives and jobs here. Finally, he was admitted to Manhattan School of Music, and moved last winter. The dream became real. We don’t see each other as often as we’d like to now that he’s started grad school, and I’m busy working and auditioning (but we have lots of fun when we do, see here), but knowing we’re doing this crazy thing together like we always planned makes me feel wonderful anyway. I’m not sure if I ever thought it would really pan out the way we wanted it to, but so far, so good. Neither of us have our dream jobs yet, but living here together, working hard to get those dream jobs is a start. And if we could accomplish the living here part, I have a feeling we’ll both eventually accomplish that whole dream job part too. It might be the most famous opening number from a Broadway show ever. The audition or “I Hope I Get It” from A Chorus Line is intense, nerve-wracking, and above all, totally awesome. Having performed as Sheila in this last summer, it’s one of the most thrilling onstage experiences I’ve ever had. The energy of the music and the choreography is infectious; it pumps through your veins, grabs hold of you, and doesn’t let go. It’s also pretty exhausting, but ridiculously fun. I think A Chorus Line is still the best, truest-to-life musical about the cutthroat world of showbiz. This performance is of the original Broadway cast at the Tony Awards (Skip the 80s movie version; it just doesn’t do this terrific musical justice…and I don’t buy Michael Douglas as a choreographer. Sorry, but NO.). Sometimes at auditions, I catch myself singing, “…GOD, I hope I get it!” What can I say? It’s a catchy number. Today is Broadway broad Carol Channing’s 912th birthday! Okay, really she’s only 89, but I feel like this woman has been old for forever! Though I’ve never cared for her abrasive voice or looks, there’s no denying she’s truly one-of-a-kind and a legend in her own right. Hello, Dolly! You’re still glowin’, you’re still crowin’, you’re still goin’ strong. Cheers, Carol! Since it was announced all those months ago that Catherine Zeta-Jones and Angela Lansbury would be playing Desiree and Madame Armfeldt in the new Broadway revival of Sondheim’s liltingly beautiful A Little Night Music, I’ve been simply dying to see it. I fell in love with Night Music a few years ago and have become increasingly more in love with it as I’ve gotten older. I love the structure of the music (every song is written in a variation of waltz time: 3/4, 6/8, 9/8, 12/8…meters with a triple feel. ), the story, and of course, Sondheim’s always brilliant lyrics. I’ve always felt Night Music was a bit underrated in Stephen Sondheim’s canon of work, perhaps even forgotten in the shadow of his masterpieces Sweeney Todd and Sunday in the Park With George, but it’s truly a musical as lovely and delicate as the lace on the country dresses of its female characters. Having seen Ms. Lansbury in her Tony Award-winning role (well, her fifth, that is) as Madame Arcati in Blithe Spirit last year, I’m absolutely ravenous to see her in a musical. I’ve listened to her sing “the Worst Pies in London” and “Beauty and the Beast” a few too many times to count, so I feel it would be like fulfilling a life-long dream to see and hear this phenomenal lady live in a musical. Not only that, but I adore Catherine Zeta-Jones. Luckily, I’ll be in New York City in mid-March, so I’m planning on making a trip to the Walter Kerr Theatre to see it, and I can’t wait!